Candidate demonstrates the knowledge, skills, and dispositions to use processes and resources for learning by applying principles and theories of media utilization, diffusion, implementation, and policy-making. 1. "Collaborative Online Content Development"
Context: This site was developed in fulfillment of a class assignment in EDET 735–Technology for Diverse Populations. 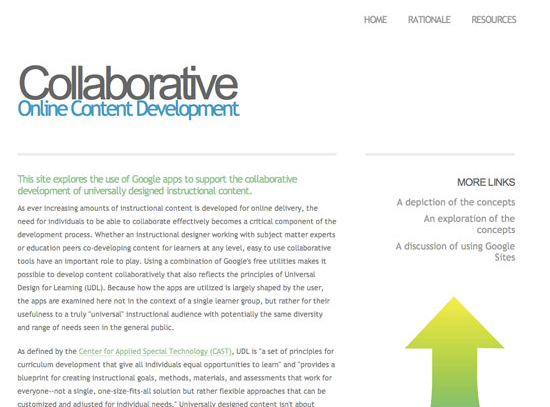 Conditions: This site focused on the use of Google-based resources to demonstrate how they could be used at no cost as a platform for developing online content collaboratively and in ways that support the principles of Universal Design for Learning (UDL). The idea for this project resulted from a conversation with a colleague who was unfamiliar with wikis and looking for a means by which a project team could collaborate in a virtual space to develop a first draft of new course content. Scope: The site is complete and is available as linked above. Role: As an individual project, I filled all of the roles required which included compiling related research, developing the screencast and building the site that houses the completed information. 3.1.1 Identify key factors in selecting and using technologies appropriate for learning situations specified in the instructional design process. 3.1.2 Use educational communications and instructional technology (SMETS) resources in a variety of learning contexts. This project was designed around a specific set of readily available, free resources to meet a specific instructional development need for collaboration in a shared, virtual workspace. Additionally, the project's focus on promoting the principles of UDL (multiple means of representation, multiple means of action, and multiple means of engagement) demonstrates how to expand the potential applicability of the Google utilities in numerous learning contexts. 2. 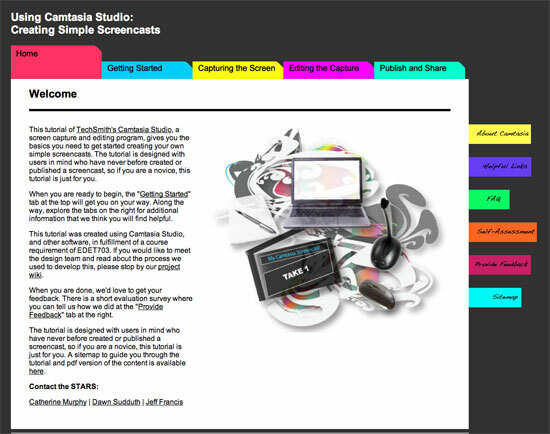 "Using Camtasia Studio: Creating Simple Screencasts"
Context: This tutorial site was completed as a group project within EDET 703–Design and Development Tools II. Conditions: The tutorial was designed to build the basic skills needed to develop screencasts using Camtasia Studio within an identified learner group of university faculty, however it is also appropriate for any novice Camtasia users. Scope: The tutorial met the assignment requirements for completion and is available online as linked above. Role: Within the three-person group who developed the site, my contributions were to develop the graphics used on this site, as well as those on the project's wiki., and to write much of the site content as well as develop the pdf guide for the site content. As detailed in the Analysis Phase of the project, specific attributes of the learner group were considered in the selection and utilization of Camtasia as an appropriate tool for integrating screencasting into the existing instructional practices of the learners. 3.3.1 Use appropriate instructional materials and strategies in various learning contexts. As detailed in the Development Phase of the project, the strategies utilized in the development and dissemination of the tutorial considered adult learner characteristics and the context in which the learning would likely occur. © 2015 Camilla D. Sudduth | All rights reserved.